Also known as "the windy city", is the third largest city in the United States with a population well over 2.5 million people. 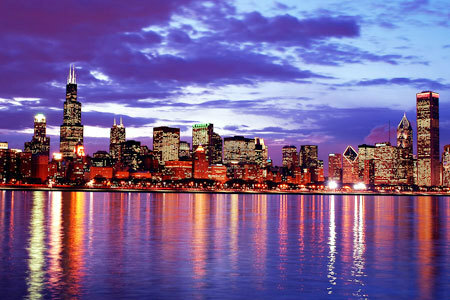 Chicago is also the largest inland city in the United States. It is located in northeast Illinois, on the southwestern banks of Lake Michigan. The Chicago metropolitan area has a population in excess of 9.5 million people. Chicagoland is also home to over 25 Fortune 500 companies to choose from. A city the size of Chicago has just about everything to offer in the way of nightlife. For those interested in good food, Chicago is famous for excellent steaks and deep dish pizza. Dining options abound from family fare, to ethnic cuisine, to the latest in trendy restaurants. Some of Chicago's most interesting dining can be found in the area of Randolph Street just west of Chicago's Loop, as well as a stretch of the south Loop, and on the Magnificent Mile. For those looking for the music and nightclub scene, a city the size of Chicago has just about everything to offer. Chicago is famous for blues and jazz, but offers just about every musical tradition. There are numerous nightclubs all over town, especially along Halsted Street, Lincoln Avenue, and Clark Street on the North Side, as well as Chicago's famed "Gold Coast", the neighborhood around the intersection of Rush and Division streets. If you're interested in Chicago, please email your resum� with an introductory letter to to Dayna Lynn at dlynn@fsgltd.com or fill out the form below.